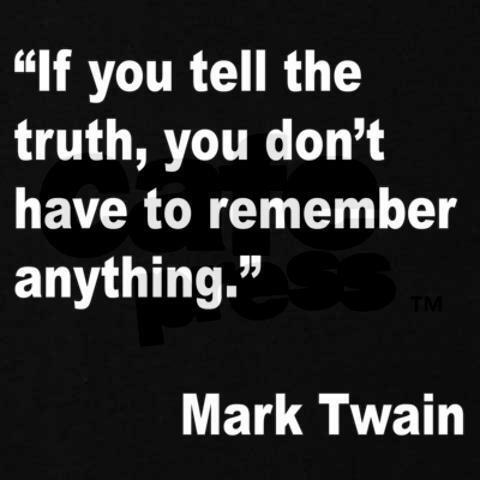 My mom, a long-time educator and avid reader, always used this quote from Mark Twain on me growing up…it’s so true! Telling the truth is a life lesson; telling the truth sets you free; telling the truth is being honest no matter what. No matter how hard you try, you can’t baptize a cat. When your mom is mad at your dad, don’t let her brush your hair. If your sister hits you, don’t hit her back. They always catch the second person. Never ask your 2-year-old brother to hold a tomato. You can’t trust a dog to watch your food. Don’t sneeze when someone is cutting your hair. Puppies still have bad breath even after eating a mint. You can’t hide a piece of broccoli in a glass of milk. Don’t try to use a dust-buster and a cat at the same time. The best place to be when you are sad is in Grandma’s lap. This entry was posted in Personal Reflections and tagged truth. Bookmark the permalink.